Rock Paper Lizard: Big bear, little bear. 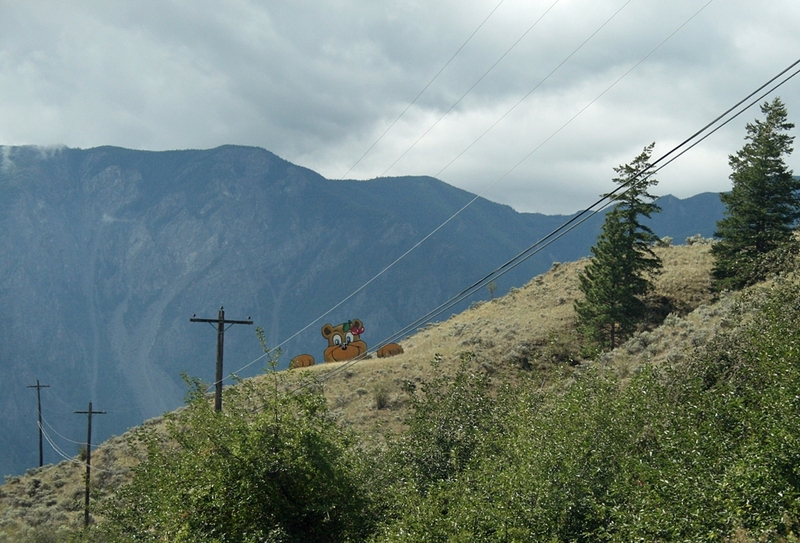 During our recent drive to the Okanagan Valley, voices from the back seat expressed a desire to see a bear. I thought there was a good chance this would happen. 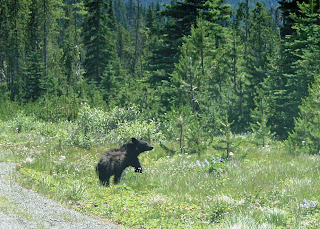 I have seen bears before along the road through Manning Park. They munch weeds and blink sagely at passing cars. But on the way there, as we entered prime bear territory, a ferocious thunderstorm overtook us, scaring all the roadside bears deep into the forest. We saw none, but we did see a tree smouldering after a lightning strike, which is pretty cool. On the way back -- a bear of sorts, a big one, near Keremeos. I feared this might be the only one we'd see. Onward, as we wove through the mountains, the back seat fell asleep. And then, in Manning Park, where they were supposed to be, a bear--on the other side of the highway. Fortunately there was a turnoff almost immediately ahead. We turned around, and making sure the bear was still there, woke up the back seat. It was just a little one, probably recently independent from Mama.